The sign of Libra has air as its first or foremost element and its house lord is Venus. Libra born has always had clarity of thoughts which are balanced, and without any hidden meaning. As this ascendant is being governed by the planet Venus, generally the natives ruled by this planet are naturally attached to music, art, and poetry. They are most often sensitive in nature and possess an artistic point of view. They are justice loving and are of peaceful nature, who would always avoid unnecessary confrontation and fights. Libra born people earn prosperity due to their virtues, are capable and experienced in trade-related activities, and are always wealthy and exceptional in their respective family. Librans have a charismatic personality. They can save a lost cause, merely just with a smile and their unique sweet ways, and the opponent won’t even realize what hit them. They utilize their charm for making an impact upon others. Libra is one of the most balanced signs. And they can be often seen balancing the difficult situations in their lives with a relative ease. Librans are known to maintain harmony between the parties. Apart from the fact that there is always a need to balance the inner as well as the outer forces operating on an individual, it is also necessary for one to take care of the likes and dislikes, desires and aversions as well as social obligations and responsibilities. Wearing a good quality white sapphire of Ceylon origin can excel the above traits in the native. Any profession where intellect and logical thinking plays an important role, Librans are believed to excel in those. Teaching, acting, trade, and the judiciary, these are the most suitable fields for them. They are very efficient in carrying out the instructions given to them. Wearing an Emerald will help them conquer the professional world with an ease. It can also boost their marketing skills which would, in turn, help in their professional growth. Unless the partner is aggressive, positive and full of passion, the Librans feel miserable. They desire their looks, behavior, and skills to be constantly appreciated. But they often lack the guts to admit their faults and often try to conceal them for as long as possible. They are very passionate and once in love, would vehemently flirt and persuade the person of his affection until the success. One of the major issues for an unhappy married life in case of the Librans is deception. Jupiter and Saturn are considered to be planets of loyalty or honesty. So, wearing an astrological Blue sapphire can make them loyal and honest towards their partner. Librans are very affectionate and friendly with their kids. They teach their children with a greater emphasis on logic and love. Kids born to the Librans learn the importance of beauty and good manners. However, their parenting skills lack only one thing, and that is an emphasis on discipline. Librans are themselves quite incapable of following rules and living a disciplined life. It is very important for them to show some firmness with their children, whenever necessary. It is always wonderful to be part of a close and an affectionate family, but it is equally important to command their children's respect. Saturn is the planet that symbolizes discipline and Mercury represent wisdom. 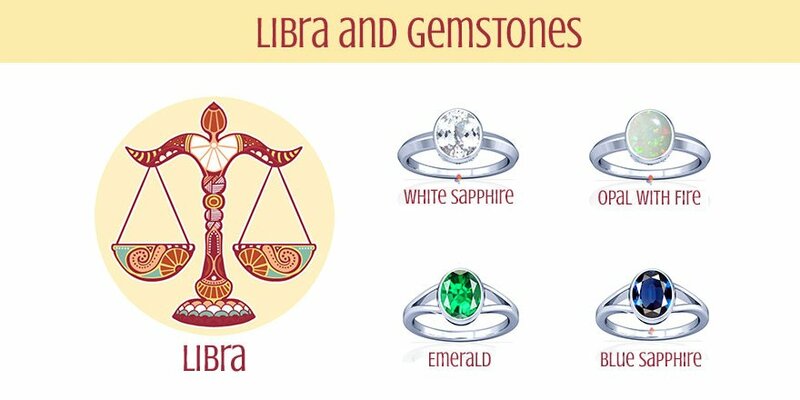 Therefore, a combination of an astrological blue sapphire gemstone and an emerald would help a Libran in attaining respect from their children.